U.S. cruise missile strikes on Syria last week elicited varied reactions from Middle East Forum fellows and staff. PHILADELPHIA – Apr. 10, 2017 – It's in the nature of a research institute to share a basic outlook. The board, staff, and fellows of the Middle East Forum (MEF) agree broadly on such things as countering Islamism, supporting U.S. allies, promoting American interests, and rewarding democratic practices. Of course, how one reaches these policy goals is a matter of debate, and argument over strategy and tactics has been a feature of MEF life since it opened its doors in 1994. 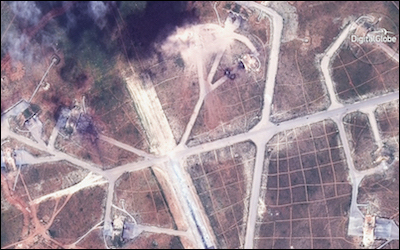 Rarely, however, has a clash of views been as sharp as now, with President Daniel Pipes calling U.S. missile strikes against the Syrian air base responsible for a deadly chemical weapons attack a "mistake" and Director Gregg Roman praising the operation. Nonetheless, we see this as a healthy diversity of opinion over how to reach common goals. Writing in National Review Online on April 7, Middle East Forum President Daniel Pipes reiterates his long-standing opposition to direct intervention in the 6-year-old Syrian civil war, which pits a motley assortment of Sunni Islamist-dominated Arab rebels, backed by Turkey, Qatar, and Saudi Arabia, against a far more unified Iranian-dominated network of Shiite, Alawite, and Christian pro-regime forces. Pipes has long argued that the U.S. should work to ensure that "[Syrian President Bashar] Assad & Tehran fight the rebels & Ankara to mutual exhaustion" while awaiting the emergence of a "moderate alternative to today's wretched choices." In addition to alleviating suffering where possible, the goal should be to "to help those who are losing, but indirectly," he explained in an April 7 interview with i24News. Pipes insists that U.S. intervention in Syria should remain indirect. In 2013, amid rising prospects of a rebel victory "replacing the Assad government with triumphant, inflamed Islamists," the application of this principle led Pipes to advocate support for pro-regime forces. Today, with the regime having regained control over Aleppo and other key real estate, he argues that the U.S. should assist the rebels with arms and intelligence on the grounds that they are now the weaker party. But Pipes insists that U.S. intervention in Syria should remain indirect. Limited strikes of the kind ordered by Trump (and contemplated by Obama in 2013) don't have much deterrent value because of the American public's well-known aversion to sustained military intervention in Middle East conflicts. "[I]t's really a paper tiger," he told i24News. One-off missile strikes also give Assad the halo (among supporters) of having stood up to the U.S. military without paying a prohibitive cost. "Unless a great deal follows, which I don't think is going to happen, this will be seen as something that the Assad regime has been able to survive," he added. "Symbolism is not a good idea in warfare." Writing for The Hill on April 7, Middle East Forum Director Gregg Roman expressed strong support for the strike against Syria. Roman's primary concern is the loss of American credibility following Obama's 2013 'red line' fiasco. Roman's primary concern is the loss of American deterrence credibility in the wake of President Obama's bungled response to Assad's chemical weapons use in 2013. By acting quickly, unilaterally, and unpredictably (all in sharp contrast to his predecessor's playbook), Trump helped "wash away the stain" of Obama's "red line" fiasco and thus restore American credibility and prestige. The "astonishingly favorable reaction to the strike throughout the world," he writes, "underscores that bold American leadership and decisive action are the way to win friends, not multilateralism and diplomatic nicety." Aymenn Jawad al-Tamimi, a research fellow at the Forum's Jihad Intel project, offers a more limited endorsement of the strike. "Besides reducing the absolute number of aircraft capable of bombing Syrian civilians (absolutely a good thing in its own right)," he writes in an April 7 Middle East Eye op-ed, "the strike is useful in sending a message that international norms prohibiting chemical weapons use cannot simply be violated and merely condemned with words." However, he warns of the dangers of escalation and expresses concern that broader military intervention "cannot be completely ruled out" given the "volatility" of the Trump administration. The Middle East Forum is dedicated to promoting American interests in the Middle East and protecting the West from Middle Eastern threats. It does so through intellectual, activist, and philanthropic efforts.